See the most recent announcements and news from the club. We had an exciting Membership Meeting last Thursday! We came together and voted on endorsing local and state candidates for the June 2018 Primary Election. Thank you to all members who came to cast their vote and support the club! 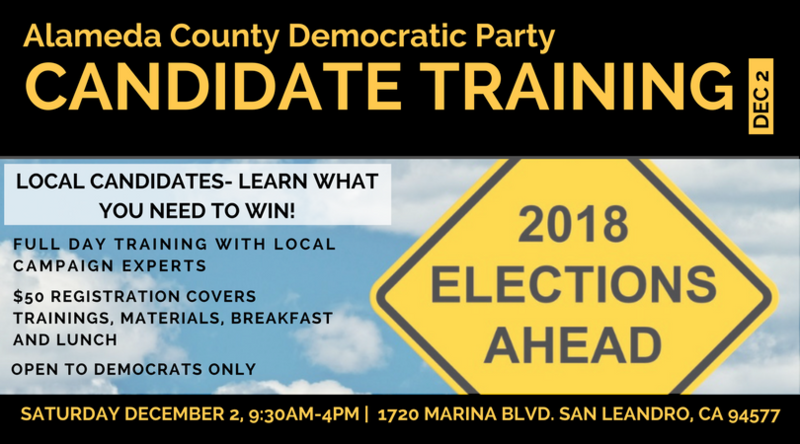 Per club bylaws, to be eligible for endorsement a candidate must be a registered Democrat and fill out our candidate questionnaire. A candidate must receive at least 60% of the votes cast to be endorsed. While the club also voted on the Alameda County District Attorney and Assembly District 15 races, no candidate reached the 60% threshold. Congratulations to all candidates who received an endorsement! Stay tuned for more exciting club news and events! The East Bay Stonewall Democratic Club has voted to early endorse Alameda County Superior Court Judge Tara Flanagan in her race for re-election. The early endorsement is a reaction to her seat being challenged by retired public defense lawyer Karen Katz. In the 1990’s, the LGBT community took to the ballot box in San Francisco to elect judges from their community, after years of being shut out by Republican governors George Deukmejian and Pete Wilson. In 2010, Vicky Kolakowski was the first LGBTQ person elected to the Alameda County Superior Court. She was re-elected in 2014. Prior to the Republican governors, Jerry Brown appointed four LGBTQ judges to the bench, beginning with the Honorable Stephen Lachs, who served on the Los Angeles County Superior Court from 1979-1999. “The East Bay Stonewall Democratic Club will do everything in its power to protect this seat,” stated club president Brendalynn Goodall. Happy LGBTQI new year from Stonewall! Happy Holidays and New Year! 2017 marked East Bay Stonewall Democratic Club 35 years of advocacy for equality. The LGBTQI community has accomplished a great deal over the past 35 years and we see that locally as well. We are thrilled that two of our most visible LGBTQI elected officials are now serving as mayors in the East Bay. John Bauters, Mayor of Emeryville, and Gabriel Quinto, Mayor of El Cerrito. John and Gabriel will serve in their respective roles for the next year. We know they will represent our community well and stand firm for our rights. Hosted the 5th Annual East Bay Stonewall Democratic Club Oakland Pride Breakfast and honored six individuals and organizations for providing leadership and promoting equality in the LGBTQI community. Special Guest Speaker: Congresswoman Barbara Lee. Educated our general membership about legislative bills of interests to the LGBTQI Community – SB179 Gender Identity & SB219 LGBT Senior Long-term Care Bill of Rights, and the Healthy California Act, SB562. Advocated on behalf of LGBTQI elders – the Trump administration was attempting to erase our Trans elders from a federal survey that determines how billions of dollars are spent on elder care and support. Hosted a community forum on immigration policy and reform and its impact on the LGBTQI community with Oasis Legal Services, National Center for Lesbian Rights, Senator Nancy Skinner and Assemblymember Rob Bonta. Successfully advocated Mayor Libby Schaaf on behalf of the re-appointment of our own board member Michael Colbruno to another term as a Port of Oakland Commissioner. Successfully lobbied Piedmont City Council members to pressure the acting mayor to resign because of hostile comments directed at our trans community. 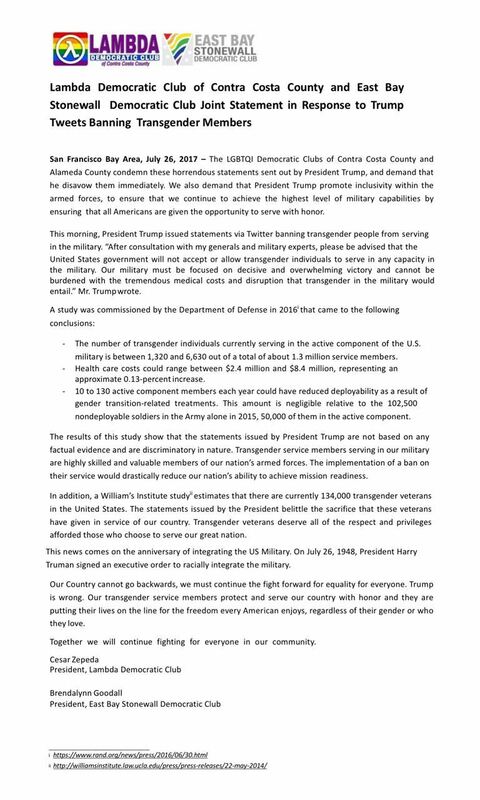 Joined Lambda Democratic Club of Contra Costa County to officially condemn Trump’s tweets banning transgender members from the military. Hosted a community forum on the City of Oakland’s infrastructure and housing bond and Alameda County priorities with Alameda County Board of Supervisor Wilma Chan and Oakland’s Policy Director for Infrastructure and Transportation, Matt Nichols. Wrote an open letter to Donald Trump on “Real Leadership” stating that Stonewall will continue to work every hour of everyday to make certain that this nation is one that welcomes and lifts up the health and wellbeing of workers, immigrants, Blacks, whites, Jews, Muslims, Transgender people, gays and lesbians. “The last few days have made clear that the pervasive, demeaning and degrading harassment women face in political circles is a problem that goes beyond partisanship and everyone is accountable. We as Democrats must continually strive to advance equality for all. The bipartisan #WeSaidEnough movement started by Adama Iwu is a clarion call to do better immediately. A confidential hotline to report incidents of harassment or abuse. Laws that provide whistleblower and retaliation protections for all victims. Our party should be an inclusive place where people can achieve their potential and make real contributions to a progressive future for our country. Democrats at every level must embrace a zero-tolerance approach to sexual harassment and assault, from small clubs to our candidates to our national party. We must look to the best practices of private entities and adapt those practices to our own operations—things like anonymous hotlines for complaints and making sure investigations are handled by experienced professionals in a sensitive and comprehensive manner. And it’s incumbent upon every single one of us to build a culture that respects and values women and the contributions we have made to our Party. This past week you let us all know beyond a shadow of a doubt that you are unfit to lead this nation. You lifted up violent racists as reasonable and valuable members of this society, stating repeatedly that “both sides” are to blame for the bloodshed and chaos in Charlottesville. To be very clear, violent racists are not reasonable or valuable, and they are solely to blame for this horrific act that led to death, horror and injury for so many. Your lack of a moral compass is outrageous and showcases at best a stunning ignorance of our collective democratic values and at worst a willful disregard for the wellbeing of our nation. We are writing to let you know that while your leadership is an abject failure, the leadership of the people at the local level abides. We are grateful today that our nation is one that is built upon strong institutions at all levels, from the national to the local. It is clear that our voices at the local level matter now more than ever. We are writing to let you know that we wholeheartedly believe in the saying that a nation is not to be judged by the character of its leader but by the character of its people. We know that what you lack in moral fiber and aptitude for service, we the people are working to exemplify every day and every waking minute. And while you have consistently chosen to not stand up against violence and abuse, we the people will stand up. We say no to horror. We say no to white nationalism. We say no to xenophobia and transphobia. We say no to divisive, non-democratic rhetoric that scapegoats and vilifies our loved ones and neighbors. We will fight for our nation, and we will be strong and unwavering in our commitment to justice and equity. It is clear that you will continue down an abysmal path that serves the narrowest possible interest: your own. While we shudder at the reality that the man currently entrusted with upholding our nation’s highest office is entirely incapable of doing his job, we will continue to work every hour of every day to make certain that this nation is one that welcomes and lifts up the health and wellbeing of workers, immigrants, blacks, whites, Jews, Muslims, transgender people, gays and lesbians. Moreover, we will continue to lift up the voices and wellbeing of women and men regardless of their race, religion or income level. We will, in short, do what you are incapable of doing, and that is to lead with heart and courage in a time of difficulty and great peril in our nation. PRIDE Special! Join the club today for only $25! In honor of the upcoming Oakland Pride and our club's 35th anniversary celebration, you can join or renew your club membership for only $25! Membership has its privileges as it allows you free registration for our annual pre-parade breakfast with Congresswoman Barbara Lee.